Background: Every week day, I have two extra little girls, the same ages as my little girls. They are delightful and the four of them get along famously. It was nap time. The dreaded time. When I announce it is nap time, two little girls disappear, trying to hide and evade me in hopes of getting out of their naps. That also seems to be the cue for the two older girls to begin fighting, or squealing. At that time, their volume somehow magnifies exponentially, which makes putting the littles to bed incredibly difficult. 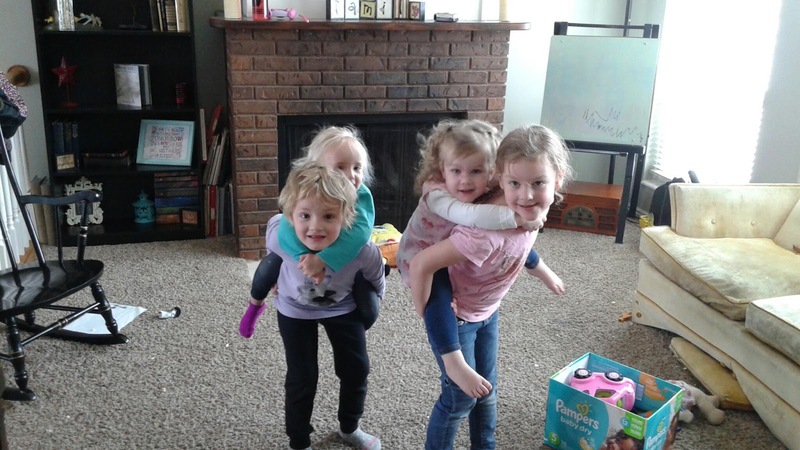 Today as I made the terrible announcement and got ready to play a ridiculous game of hide-and-seek where I always win and the little ones end up crying because they don't want to go to bed, the older girls decided they wanted to go play outside. I glanced out the window and decided that would be a great blessing to me, as the house would be quite. The big girls wanted to go check on Bryn's house (the girl Faye's age). It made her feel better, just walking up to her house, while her mom was at work and she was at my house. Since they really only lived 2 houses out of the cul de sac, I decided it would be okay. I told them it was fine if they came right back home. They needed to report in to me that they were back, and then cul de sac rules apply. You may play outside as long as you do not play in the street. No going into people's back yards without their permission. We reviewed the rules, the girls agreed to them, and I helped them put their winter things on, and then chased down Taelyn to tuck her in first. Taelyn sleeps in Beth's bed, and Beth was patiently waiting for me in my bad, probably dreaming up new schemes on how she would evade naptime today. I read a story to Tae, tucked her in, and then went to get Beth all squared away. I pulled the blankets up around her neck when I heard Beth's door opening. I went back to her room, and Taelyn was standing there, her big brown eyes looking at me sadly. "Peed." She stated simply. She then pointed to the bed. Now, Taelyn is a tiny nymph of a thing, and I am amazed that she is potty trained. Amazed and jealous, if you want to know the truth. I checked the bed, and indeed, it was peed in. We changed her into a pair of Beth's undies (they wont be missed, because, you know, Beth doesn't really care all that much) and a skirt because any of Beth's pants would just slip off her tiny waist. I stripped down the bed and Tae helped me wipe down the mattress with antiseptic wipes. We put new sheets on, and this time, I sat next to her and read 2 stories, and sang 5 songs. She usually goes to sleep half way through one story, but today she was much more difficult to get down. When her face had relaxed from the anxious grandma look she happened to be wearing, into the sweet cherubic sleep of a toddler, I left the room, and did the same thing with Beth, minus the changing of the bedding. She eventually dropped off and as I left Faye's room (because after the third time of trying to get her to go back to sleep in my room, we decided a change might help), quietly closing the door behind me, I did a happy dance going down the hall. Both littles were asleep! It had taken an hour, but they were finally, both sleeping! Keith had just gotten home from school, and I asked him if he had seen the older girls playing outside. He said no. The beginnings of worry crept into my heart. I sent him to Bryn and Tae's house to see if the girls had somehow managed to go inside, and then if they weren't there, he needed to check with the next door neighbor, because Faye likes to play there sometimes. He came home saying they were not in either place. I called my neighbor and asked if she could come sit at my house while the babies slept, and I would drive around and look for them. She is wonderful and came right over. I inspected the snow all around my house, and there were no fresh prints. And right then, the snow began falling. Not the little tiny misty flakes that had been going off and on all day, but the big gorgeous lazy flakes that I love so much. Except I couldn't enjoy them, because I was worried about the little girls. I drove over to Bryn's house and looked for footsteps. I didn't see anything. I knocked on the door and upset the dogs who went into a barking frenzy! I peered through all the windows I could find. I went to the back and did the same. There was no sign of them. I got back in the van and slowly drove around the neighborhood calling for them. Panic rising, bringing tears to my eyes now. I called some of the moms in the neighborhood, wondering if maybe the girls had decided to go play with some of their other friends in the neighborhood. My sweet friend put up an alert on the neighborhood facebook page, asking if anyone had seen the girls. The immediate response was wonderful and heartwarming, but ultimately negative. No one had seen them. I began praying harder and crying and driving and calling for them out the window while I drove. I can do some serious multi-tasking when I need to! I tried calling Brynlee's mom, but I knew she didn't get service in the building where she is working. I called Jeffrey in tears. "I can't find the girls. I put the babies down for a nap, and the girls went out to play in the front, and they are gone and I can't find them!" I choked into the phone. Jeffrey immediately said "Okay. I am coming." He hung up, and left work immediately. I love that man! I tried again to call the girls' mom, but while I was calling her, I got a call on the other line. As a rule, if I don't recognize the number, I don't answer it. I didn't recognize it, so I let it go to voicemail. Besides, I was trying to get a hold of the girls' mom. But I did listen to the message as soon as it was left. It was a lady named Angie. She said she was at the round about half a mile away, and the girls were there. They were standing on the corner, looking as if they were headed to the park across the street.The main road was busy with cars whipping around the round about, and being a mom with young kids herself, she thought they looked to small to be out alone in the middle of a snow storm on a busy road. She asked if they needed help crossing the road, and they told her that they were lost. Faye gave her my name, number, and our address, and the lady called me. When I didn't answer, she offered them a ride, and those silly little girls accepted. Thank heavens that she was a good person! She drove them back to our house. As she was driving them, I called her back, and she explained what had happened. I fear I may have become a tad bit reckless with my driving once I knew where they were, and that they were not in a safe place, like in the neighborhood, rather were out wandering the main streets! I got back to the house no more than a minute after she did. Jeffrey was there. He, too, had been out driving the neighborhood looking, but had gone back to the house just then. We thanked the lady profously for stopping to help the girls, and for giving them a ride back to the house. She said I should be proud of Faye for knowing to give my name, phone number and address. I am proud of her for keeping a cool head, even when she was cold and scared. The lady said that the girls had commented that I would be so mad at them, and they were worried about what I would say when I found them. Rightly so, too! We took them inside, and my wonderful neighbor went home. We got their wet clothes off of them, and then after they were warmed up, Faye came and told me the whole story. They had found a way into Bryn's house. While there, they tried to make some cotton candy with the cotton candy machine. They couldn't figure out how to work it, so they put it away. They then sat down and watched some television. I am not sure why or how, but Faye did mention that there were two or three tvs on at once. Then, Bryn wanted to take Faye to her grandpa's house, so they turned off the tvs and headed out. Except after they had walked for a bit, they realized they were lost and had no idea how to get back home. That is when the lady stopped and helped them. How innocent it had all seemed to them! Neither of them realized that they were out of the neighborhood. Jeffrey and I, of course got to lecture them on SO many different things! We talked about why we have rules. Brynlee said she didn't know why her mom wouldn't let her stay at her house while she was at work. I explained that they came to my house so that I could make sure they were safe and that nothing bad happened to them. But if they didn't follow the rules, I couldn't make sure they were safe! We talked about not leaving the neighborhood. We talked about how they should have come back and reported to me, as they had agreed to do. And finally, we talked about what a huge blessing that such a kind lady stopped to help them. She could have been a bad person, and the girls could have been kidnapped! Stranger danger! We went over and over with them how it is never ever okay to get into a stranger's car. Even if she is helping them! They were so lucky! If they are in a situation like that again, it is fine to give the person trying to help them my phone number, or even my address, but under no circumstances are they ever allowed to get into the stranger's car. They can tell the person that they will wait right there until Jeffrey or I come and get them, and we will always come and get them. Especially if the stranger calls us. The only exceptions to that rule are if it is a policeman, or if the person has our secret family password and can tell them. Then they will know that it is okay to go with them. And then, on top of this all, I got a call from my neighbor who said that while she hadn't seen them today, she had seen them yesterday playing by the busy road, and on the rail road tracks, and in front of an empty house that is for sale. WHAT?! I was floored. I asked the girls about it and they both said no, they hadn't done that. I am going to have to talk to the neighbor and find out more what she saw. The girls hadn't been gone that long yesterday, only 10-15 minutes when they went to "check on the house." But then again, they were on bikes, so maybe it was them. They both denied it and seemed confused, so maybe my neighbor had seen someone else out there. I need to verify the facts. But when I heard that, we had to talk to the girls about never ever playing on the train tracks! The trains wont stop, and they could very easily be hit and killed by the trains! And there are so many trains that go by there. There is a train about every 15 minutes. I felt so guilty for having lost the girls! I did eventually get to communicate with their mom through text, but I didn't fill her in on the whole extent because I didn't want her to worry. Jeffrey decided to not go back to work as there were only about 45 minutes left. He was happy to have an excuse to come home early as he wasn't feeling well. Happy that it had turned out well and that he could stay home, but not happy that they had run off, I mean. And everyone was safe and well, and gradually the panic subsided. But the tears still come. When I think about that terrifying hour of searching for them, and not really knowing what to do. Should I call the police? Should I call all my neighbors? Do I call her mom at work? Driving, searching, praying, pleading, begging. That hour of dread, trying to ignore my imagination and focusing on staying calm and rational. I was fine if I didn't have to put voice to my words, but when I asked my friend if Faye and Bryn had been there to play with her daughter, I lost it. I could barely speak from crying. And I am sure it was only half from the pregnancy hormones. When my friend came to pick up her girls, I made sure they were downstairs so I could tell her the whole story without them interrupting. If they had been in the room as I went over that afternoon, I am not sure I ever would have gotten through it, and it would have been much less un-biased as I was trying to make it. I tried so hard to keep unemotional and focus only on the facts as I recounted what had happened. Obviously, she was mad. I had been too! She was especially mad because this had happened once before with the previous sitter. Bryn had wandered off while Taelyn was taking a nap. The difference was, a friend of their family found Bryn and took her home, but Brynlee didn't know her sitter's number or name, and so the friend had kept her there, but was watching for someone to be looking for a child, or police cars, or anything. I guess the sitter hadn't gone out looking, and that day my friend quit her job, because she couldn't know for sure that her girls were safe. Also, her husband (their father) works for Union Pacific, and had talked with them many times about the dangers of the railroad. Both she and I are hoping that our neighbor had simply mistaken their identity and saw two other girls playing there, and not our own, who have been warned again and again to stay away! What an emotionally exhausting day today has been! But the most important thing is, they are safe. They were protected. And they are never ever again allowed to go outside if I am not right there with them! Yikes! But yours sounds like a reasonable plan. When kids show you that they can't be trusted, you enact a waiting period and let them know that they must earn your trust back again, in small increments. Thank heavens they are okay and that you found out what was going on. So scary! Isn't being a mom challenging at times?? Whew! Holy moly that is my worst fear, losing my kids and driving off a bridge into water with all of my family in the car. So glad they were protected because that so could have been a horrifying ending! Are you watching the neighbors kids during the day? I haven't been on in a while I need to catch up.